In some of his public talks, His Holiness makes a joking observation of how Tibetans are so sharp (dungu) that they took the best of all religions from India, the warmest of clothes from Mongolia, and the most delicious of foods from China. It is a good joke, and the validity of the observation, at least in the first instance, makes it work. I only disagree with him on his third example. Being the next-door neighbour, as it were, of a race whose cuisine is probably the most well-known and celebrated world-over, can give anyone (perhaps even His Holiness) a little inferiority complex about his or her own food culture. Another great man, George Orwell, annoyed at the prevailing snobbery around French cuisine and the routine dismissive charges that “English food was the worst in the world”, was driven to write an essay, “In Defence of English Cooking”, for the Evening Standard. I am attempting to follow in the master’s footsteps with this exploration of Tibetan culinary culture. Some years ago I wrote a piece on Khabsay or New Year cookies which many readers wrote in to say they enjoyed. Since Losar is rolling around again I hope this essay on Tibetan cuisine will provide some reading pleasure to Tibetans during this season when, no matter how cruelly the political winds are blowing in Tibet, we might take a brief time off from the struggle and enjoy good food and drink in convivial company. The fundamental staple food of Tibet is, of course, not borrowed from China at all. Tsampa or roasted barley meal is so different from the Chinese staple of rice and wheat, that when Chinese Communist soldiers first came to Tibet and tried to eat tsampa they choked and gagged on the powdery stuff – much to the amusement of Tibetan bystanders. But as tricky as it can be to eat without mastering the proper technique, tsampa is the foundation of a noble diet, similar in part to what people ate in the classical world. In H.D.F Kitto’s remarkable introduction to ancient Greece (The Greeks) he tells us that “Barley meal, olives, a little wine, fish as a relish, meat only on high holidays – such was the normal diet.” Pliny tells us that gladiators in Rome were also called hordearii, barley men, because of the amount of barley, a muscle building food they ate. Hordeum vulgare being the Latin for barley. In the Odyssey (T.E. Lawrence’s translation) when Odysseus returns home to Ithaca he is given a meal by Eumaeus the swineherd, who does not recognize the hero as his old master. “When the two roast piglets were done he carried them to Odysseus and set them in front of him, still on the spits and piping hot. He dusted them over with barley meal….”. Tibetans prefer boiling to roasting meat but I suppose like the Greeks they don’t like loosing the fatty juices. I’m not sure if this common practice but I once saw a Khampa man in Mustang skewer a large chunk of boiled mutton out of a pot with his knife. He then dusted the meat with tsampa so that the juices wouldn’t drip down his chin when he went to work on it. Ritchie also informs us that making tsampa was one of the ways in which Neolithic man grappled with the considerable problems posed by moving to different foods from those eaten by the earlier hunters. Various ingenious processes were carried out by Neolithic man to get to the edible part of cereals – threshing, boiling the heads, and so on, but roasting barley-corn and then milling it, in effect making tsampa, was one of the first ways. Older Tibetans need little encouragement to hold forth on the wonderful properties of tsampa. But in colonial times, snooty European travelers in the Himalayas had less elegiac views of our national staple. An English lady in Ladakh was horrified to see the natives eating tsampa “…with their fingers …it almost makes you sick just to watch them wolf it down.” Strangely enough, our old friend Heinrich Harrer joins the sahibs and memsahibs in this condescending chorus. In Seven Years he writes “Of course one cannot compare the productivity of Tibetan workers with that of Europeans. The physical strength of the natives was much inferior.” He ascribes the low productivity of the Tibetans to their staple diet of tsampa. Henrig la seems to have forgotten that he survived his tremendous trek across the Jhangtang in winter on a near exclusive diet of tsampa, not Wiener schnitzels. Tsamba has much to recommend it, and if I were a poet I would write an ode to the stuff. It is sustaining, digestible and cheap. For nearly three months we had tsamba for breakfast and tsamba for lunch, and the diet was neither as unappetizing nor as monotonous as it sounds. One of the great virtues of tsamba is that you can vary the flavour and the consistency at will. You can make it into a cake or you can make it into a porridge; and either can be flavoured with sugar, salt, pepper, vinegar, or (on special occasions for you only had one bottle) Worcester Sauce. And, as if that were not enough, you can make it with cocoa instead of with tea. I would not go so far as to say that you never get tired of tsamba, but you would get tired of anything else much quicker. The New York Times (Wednesday, June 28, 2006) added that “The new health claims for barley are substantial and are based on “significant scientific evidence.” Other claims being made for a “barley-inclusive” diet is ‘reduction of risk for cancer of the stomach and intestine’; ‘reduction of risk of cardiovascular diseases’; ‘reduction of risk of Type 2 diabetes ’; ‘stimulation of the immune system’; and ‘contribution to reduction of the risk of obesity’. Traditionally, it is not only Tibetans who have made nutritional and medical claims for barley. The Japanese make a tea of roasted barley, called mugicha (boricha in Korea) which is said to cleanse the blood of impurities and reduce stress. In Britain you have Lemon Barley Water, a great tonic popular with parents and children alike. It has long been the official drink supplied to players at Wimbledon. You fill your shallow wooden bowl with tea, then you let the butter melt in the tea (the butter is usually rancid and has a good cheesy flavour); then you put a handful of tsamba in. At first it floats; then like a child’s castle of sand, its foundation begins to be eaten by the liquid. You coax it with your fingers until it is more or less saturated and has become a paste; this you knead until you have a kind of doughy cake in your hand and the wooden bowl is empty and clean. Breakfast is ready. The watchword is “coax”. You have to go about the process slowly and gently, “folding” the tsampa into the tea like you would fold melted chocolate into egg-white when making chocolate mousse. Tibetans don’t use the word “knead” (zi) for the process of preparing tsampa for eating. The word used is “yoe” which would mean blending or mixing but, I repeat, done gently. When prepared in this fashion you get a mixture that is not sticky or doughy but soft and manageable. This end-product is now called paag, and not tsampa anymore. You can then make convenient lumps of the stuff, ready to be eaten, without tsampa sticking all over your hands and everywhere. A small lump or roll of paag squeezed in your fist is called daga. Another way to eat tsampa is straight and dry. Tibetan’s call this method tsang-gam. You take a spoonful of the dry meal and pop it in your mouth. Another way is to just lick the dry tsampa from a bowl. When old tsampa hands do it, it looks deceptively easy, but the practice is not recommended. If you insist, you should know that the trick is never to inhale when performing tsang-gam. If you do, even a little, you will suffer a coughing spell, possibly even a nasty choking experience. Death by tsampa! More improbable things have happened in Tibet. Tibetan peasants, especially those from the Tsang region like to add a handful of tsampa to their bowl of barley-ale (chang) and eat it with their fingers in a fashion called kyo-mak da. I once tried adding tsampa to red-wine as Carson Ritchie tells us Homer’s heroes did. The result was, well, interesting. For breakfast tsampa is usually consumed as cham-dur, or, as Tibetan restaurants feature it on their menus, “tsampa porridge”. It is a dish much loved by children. My daughter Namkha Lhamo regularly eats cham-dur when we have tsampa in the house. You put a pat of butter in a bowl with some powdered cheese (chu-shib) and a little sugar (preferably brown sugar) and pour in some hot tea (or hot milk) in the bowl getting the butter to melt and blending with everything else. You then stir in enough tsampa so that the mixture is more runny than doughy – porridge consistency – and get on with your breakfast. Children in Tibet also love to eat the barley grain (ney) after it is roasted and popped. This Tibetan pop-corn is called yod. The popped barley is milled at a water-mill called the chu-thag and made into tsampa. Quality tsampa milled from high-grade barley, the grain washed and prepared in a special way, is not only delicious but has a wonderful sweet aroma to it. When I was in Mustang our phokhang or commissariat at Kag-Beni had a special supply of tsampa that was so good that one of our instructors, Thondup Gyalpo la (a former sergeant in the Guards regiment in Lhasa) would just mix it with water from the stream and eat it without any side-dish or sauce. He insisted that adding anything else would spoil the taste of the tsampa. Tsampa eaten in this way is called chu-paag. For dinner you could make a nice soup or broth called tsam-thug with tsampa, meat and vegetables, but more on that in Part II of this essay. In ancient Tibet, tsampa was served at banquets in large brick-like cakes called masen. At the Tibetan Institute of Performing Arts (TIPA), Sonam Wangdu la, one of my star comedians who was also a master-chef in old Lhasa, once served this dish at a New Year dinner at TIPA. The tsampa cakes were accompanied large joints of cooked mutton and radish. This ancient banquet was called sozi masen. Tang dynasty accounts mention that Tibetans pressed a lump of tsampa with their thumb, and used the hollow space as a spoon to scoop up stew or vegetables. 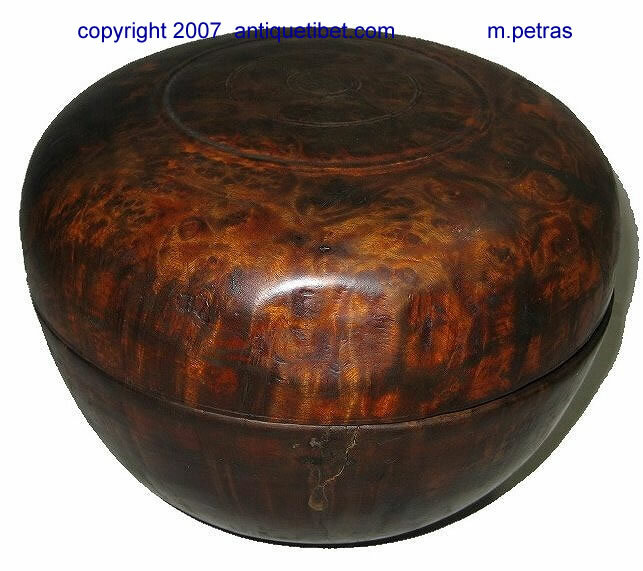 A largish wooden bowl or gog-phor is generally used for mixing and eating tsampa. This bowl has a tight-fitting lid which can be taken off and used to hold your side-dish (paag-drel) of stew, soup or vegetables. This will be discussed in Part II. You might also also use a jha-phor or tea bowl, for drinking tea or beer. 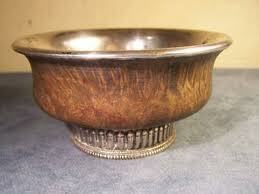 It is smaller and shallower than the tsampa bowl and the inside is sometimes lined with silver. Your set of wooden bowls might include a tiny bowl (with lid) in which you keep a supply of your favorite hot-sauce. This bowl can be stored inside the large gog-phor after you’ve had your meal. These wooden bowls are manufactured in southern Tibet and in Mon Tawang. They are also made in Bhutan by skilled wood-turners. Some of these bowls are credited with being able to detect poison. An important article for a tsampa based meal is the sol-ray or napkin. Its usually the name size as a napkin in the west, but sometimes bigger. It is important to have this on your lap as tsampa tends to spill a little, no matter how careful you are when you mix it. When you were traveling the napkin could be used to tie up your bowls and things in the napkin. Such napkins are handy as they can, at a pinch, substitute for a bowl to hold lumps of tsampa or meat. In Bhutan people use a wooden bowl for their soup like Tibetans but their traditional rice dish is always served in a large napkin called the tho-ray, that everyone carries about with him. I saw a photograph of the former king, Jigme Singe Wangchuk, using such a napkin when having a meal with a crowd of ordinary Bhutanese people. A nice democratic gesture. Anyhow, If you haven’t picked up the skill of mixing tsampa in a bowl you can use a bag to do the mixing in. 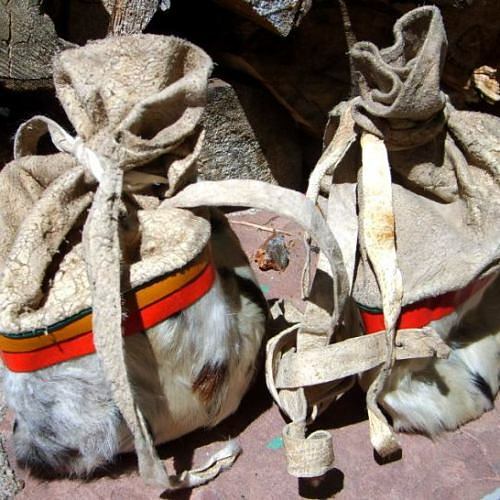 In Tibet a pliant bag of thin leather with a drawstring (oto) on the opening, is used. It is called a thang-khug. You can use a plastic bag at a pinch. I have seen Tibetans doing that. It mustn’t be too stiff, but I guess it shouldn’t be too thin either, and tear. There is a larger tsampa bag of leather and fabric which is called a tsam-khug, and is largely used for storing and sometimes serving tsampa at a table; but not for mixing. I saw a beautiful tsam-khug leather bag trimmed with brocade, at the monastery of Gar Rimpoche in Rarang, Kinnaur. The bag had a serving spoon inside called the tsam-thur, which is used to serve out the tsampa. Generally you would use a special wooden container with a lid, called tsam-phor, to store and serve tsampa at a table. 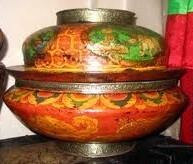 These bowl-like containers are often painted with designs on the outside and laquered red on the inside. Some of these vessels are even decorated with turquoise, coral and semi-precious stones on the outside. In the old days a high lama, a merchant prince or an important official might have such a fancy tsam-phor on his side-table. 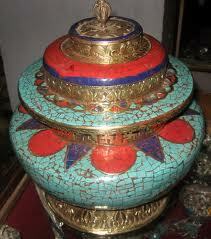 One tsam-phor I saw had a special lid which incorporated a small bowl on the top. That small bowl was used to hold a supply of thue, which is a rich concoction of powdered-cheese, butter and brown-sugar (bhurom) used to flavor the tsampa. Tsampa is also eaten in Turkestan where it is called “talkhan”. In Bihar and some parts of north India a kind of tsampa (sometimes mixed with milled chick-pea) is called “satthu” and eaten by peasants and labourers. In certain parts of north China where tsampa is eaten it is called “tso-mien“. All Chinese Communist publication, even those in English, invariably refer to Tibetan barley, not by its native name of “ney” or “dru”, but in pinyin as Qingke – probably pronounced “chinky” (I think). The honorific for tsampa is su-shib. Of course the Dalai Lama has a very special tsampa made for him which is called jamin. On the other hand inferior tsampa eaten by poorer people is called kamsob or tsam-sog. This is sometimes mixed with pea-flour (ten-tsam or ten-shi) which is generally cheaper, though quite flavorful in its own right. Tsampa is used in religious ritual for making sacramental cakes called tsok and torma, and in the sangsol ceremony where handfuls of tsampa are tossed in the air (tsam-tor). Tsampa is also burnt and the smoke offered not only to various deities, but sometimes as an act of compassion to yidags (tantalized spirits) existing in a special subdivision of the Buddhist hell. Since these creatures are said to take in nurishment only through smell, the burnt-tsampa offering (soor or tsam-soor) was an effective way of feeding them. Tsamkhu tongpa dap pa: To beat an empty tsampa bag. To try and get something out of nothing. Tsampa gam lingbu tang. Eat dry tsampa and play the flute at the same time. Do two incompatible things. Conflict of interest. Tsampa rang ge zay, thang-khuk mi la yok. You eat the tsampa but put the tsampa-bag on someone else’s (head). To profit from a situation but let others suffer the consequences. Tsampae khyekyag bhutog ki chay. Baking-soda acting as guarantor to tsampa, (both can be blown away by the wind). One insubstantial person cannot support another. Tsampae-drima kha. Smelling of tsampa. Having a Tibetan quality. Tibetan-ness. Babu Tharchin la, the editor of the Tibetan newspaper in Kalimpong, The Tibet Mirror, in an editorial (October 1, 1952) called on all Tibetans, specifically the people of Kham, to unite. We, the tsampa eaters, chuba wearers, dice players, raw and dried meat eaters, followers of Buddhism, Tibetan language speakers, the people from The Three Circuits of Ngari (Ngari Korsum), Four Horns of Central Tibet (U-Tsang Ru-zhi), Six Ranges of Eastern Tibet (Dokham Gangdrug) and the Thirteen Myriarchies of Tibet (Bhod Trik-khor Chuksum) we must make the effort to end the [Chinese] occupation. Perhaps we could join our brothers and sisters in Tibet in this culinary revival. The health benefits are undeniable and tsampa has the unqualified blessings (jhinlap) of the FDA, which many Chinese food imports deservedly don’t. Eating a tsampa meal, even occasionally, with your family would be a good way to remind ourselves, especially our children, of our Tibetan heritage. Perhaps we could do it on Losar. In old Tibet your always had the Sozi Masen banquet on Losar (especially at the Potala) even if other bills-of-fare were enjoyed on that day. Jews eat unleavened bread at their Passover meal to remember the exodus of the children of Israel from Egypt to the promised land. So perhaps we could incorporate tsampa in our March 10th breakfast. This is just a suggestion. I’m sure readers will be able to come up with other and better ideas of how we could create a meaningful ritual meal for that day. Send in your thoughts. Any information you might have on tsampa-manufacturers or retailers in the USA, India and Europe and other related subjects would be really welcome. Thanks. Note: This is the first of a Four Part series on Tibetan culinary culture. So many people have given me bits of information at one time or the other that I haven’t quite been able to keep track of everything. A full acknowledgement will appear at the end of Part IV. Thank you for this great piece that whets my appetite! I love tsampa, but I must admit that after a while it gets boring, especially for someone like me who grew up with a large variety of different food. I lived on tsampa for nearly two months while traveling to Mount Kailash. I had strictly nothing else: tsampa for breakfast, for lunch and for diner. In addition, the only butter I managed to purchase from the district town was definitely rancid (with mold and a blue cheese flavor). Yet, with this diet and the altitude, I never felt healthier in my life. In Lhasa, my favorite breakfast has always been yogurt and tsampa — the kind of Muesli we eat in Switzerland, but without the fruits… I forgot from where I got the tsampa, but I would buy two jars of yogurt every morning from the Barkhor, after enjoying early circumambulations and juniper burning. Finally, I remember a friend from Chile who, after tasting Tibetan tsampa, was not only happy to share ethnic origins with Tibetans, but also to share a culinary delicacy. According to him, kids from Chile would enjoy a meal made out of roasted barley, milk and sugar. Let me step into this in a somewhat (surprise) contrarian mode. Here are just some thoughts I had after reading part one of your essay; perhaps what you say in subsequent parts will respond to or (perish the thought!) demolish my comments here. It is one thing to speak in praise of tsampa; you’ll get no argument from me on that. It’s another to come to the defense of what one construes as an entire national cuisine. And that seems to be the thrust of what you’re trying to do when you title your piece “In Defence of Tibetan Cooking,” in homage to Orwell and his own fight against the low standing generally accorded English cuisine. Jamyang-la, if you have to defend a culinary tradition, the argument is already lost. Individual foods taste good or they don’t. It’s possible for an individual’s tastes to change, of course, and for someone to begin to appreciate something later in life that was previously unpalatable. But that change is, shall we say, gut-level. It’s certainly not cerebral. The bottom line is someone can’t just be argued out of a decision rendered by his or her taste buds. It’s like other visceral pleasures: music, humor, etc. Indeed, defending a tradition of cooking is akin to having to explain a joke: a joke in need of explaining is a failed joke. This goes too for Orwell’s “In Defence of English Cooking.” If you look closely at that essay—a very short essay, by the way—you’ll see that it is heavy with references to puddings, sauces and other things that, while English, don’t stack up to the substantial and varied main courses needed to constitute a gourmet school of national cuisine akin to those of China, France, Italy, and India. Orwell’s inclusion of haggis (a dish that served as a running joke in Mike Myers So I Married an Axe Murderer) in an essay on English cooking should be a clear signal that his was a lost cause. Were the essay to be published today I can only assume there would be denunciations from the Scottish Parliament accusing one Mr. Eric Blair of poaching in Scotland in order to fill up his meager menu of edible English cuisine. This is not to say there aren’t good—nay, delicious!—Tibetan dishes. Thukpa and momo come most easily to mind (and allow me to plug the fantastic thenthuk served at Anyetsang’s Little Tibet restaurant here in Bloomington, Indiana), though in both cases they represent Tibetan variants of dishes—hearty soups and dumplings—that are typologically present over a wide geographical expanse stretching from Mongolia through Southeast Asia. But the sum total of these still doesn’t add up to a refined national cuisine of distinction. And don’t throw boiled meat into the equation! That’s hardly likely to convince the producers of Iron Chef to add an Iron Chef-Tibetan to their line-up of Iron Chef-Japanese, Iron Chef-French, Iron Chef-Chinese and Iron Chef-Italian. (Note that there is no Iron-Chef-English in residence at Kitchen Stadium, the putative home of this Japanese program…) In the U.S. most Tibetan restaurants, while serving some fine Tibetan dishes like the aforementioned momo and thukpa, often supplement their menus with Indian, Chinese or Thai cuisine, or else come up with their own fusion dishes (particularly in cosmopolitan Western cities). Then there’s that odd concoction, Tibetan vegetarian cuisine. Veg momos? Which chol-kha is responsible for that? Well, adaptation is inevitable under the circumstances of exile in India and the Tibetan-Western interface. After all, beef is off the menu in India (which is perhaps why dried meat is not something Westerners remember from their sojourns in Dharamsala). Then again, momos are an interesting case: in many places in India one increasingly finds Indians making and selling momos at stalls and stands on busy streets. That said, let me return to what I stated at the beginning. I can only concur with your praise of tsampa. The quote from Peter Fleming has long been a favorite of mine, for I’ve also, like Christophe, enjoyed the versatility of tsampa: mixed in with tea, with yoghurt, with… yes, instant coffee (and sugar) even. And day after day (mostly for breakfast) it was never boring. At the outset of my first visit to Tibet, Ling Rinpoche in Labrang Tashikhyil asked me for my impressions so far and I mentioned that I hadn’t found any tsampa. He laughed at my response and had a very large sack of it brought to me. It was delicious. And often I’ve wished it were easily available in the US! Sure, Orwell didn’t do a very good job of defending English cooking against French culinary snobbery, but his was just a brief op-ed, while my four-part opus will be the last word on the subject. Those of you (especially Tibet experts) who think that Tibetan cooking can be reduced to boiled meat, thukpa and momo, just wait till part IV is posted, when all will be revealed, and long-suffering humanity will finally have a healthy and delicious alternative to msg and cat-meat. Very well, my friend: Food Fight! Jamyang, The question remains: whose cuisine will reign supreme in Kitchen Stadium?! “I look forward to Jamyang-la’s defense of the indefensible: pagtse makhoel! That is, for those not fortunate enough to sample its delights, strips of raw tshampa dough swimming in gobs of clarified butter (if you’re lucky, otherwise Dalda) with heaps of sugar on top! P.S. “hrijots” represents a loan word from Chinese, “shui jiaozi” 水餃子, or boiled dumplings. The idea to have a tsampa eating day for Tibetans all over the world on the tenth of march sounds like a good idea…but then it seems that the tibetan community overseas be it in europe or elsewhere is quite strong already in remembering their culture and heritage.Sometimes as a person born in germany and sometimes despised for the horrors perpetrated by this country I have envied the Tibetan people for their integrity and so many cultural and spiritual riches they can be proud of.But then I have also learned so much from the Tibetan people ..not only the Buddhist teachings…but from the Tibetan people themselves…the idea to ‘never give up’…to laugh in the face of adversity ..to saty grounded in ‘common sense’. Anyway as far as tsampa goes my fondest memory is of tsampas mixed with hot chang and sweets ..may be some pieces of cheese strewn in…it is called ‘chang -goor’ I think and mostly served around Losar. But compared to all the other delights of tibetan kitchen tsampa seems a little boring..unless enriched with nuts and raisins,hot milk and honey…oh well…tsampa really inspires culinary creativity. Well,hope to hear more of all the other delights such as the various kinds of momos ,shapaleb,and all. Plus there is always new surprises to the Tibetan Kitchen such as the incomparable ‘fried icecream’ in the Snow Lion restaurant of MCloed Ganj. Indeed, tsampa is great with almost anything (I don’t think I’d go for the gobs of ghee, though…). Since you mention chang, I have to say that’s one thing I wish were easily available in the West. I had some canned chang in Beijing last year (yes, it’s now brewed and canned; I’m not sure where the brewing operation is based). The taste was a teeny bit sweet. And cheese (chura): the Trace foundation has sponsored a cheese making operation in Amdo that produced a cheese that was European in texture (i.e., produced in round wheels and easily sliced and eaten: no broken teeth) but with the absolute flavor of first-rate Tibetan cheese. It was sold for a time in NYC at one of the Whole Foods outlets, but I haven’t seen it in several years. It’s really good stuff. As far as chura goes, at my Dhasa house we used to have two sorts of Ladhaki chura. One was the expensive sort, softer, and in round pellets with finger prints on it. This was delicious and the sort used in the dumplings mentioned above. The other sort was the more-familiar cement-hard cubes that needed to be in the mouth all day to be able to get anything out of them. Then there was the time that I broke my arm. My brother lives in Injee Lumpa and so made the naekhor to Harrod’s Food Hall and sent off a package of a whole stilton, in a clay jar. There was so much of the stuff that I had to share it around and various ODWs will perhaps remember the treat which was even better than the Kalimpong cheese packages we used to share (remember those?). My cook said that they used to have a similar cheese in Tibet called Churue (“rotten cheese”), which he liked, as he did the stilton. Also the package contained tins of anchovies, so it was Pizza Nite over at Glenn & Roberta’s place. As for Chang, I wasn’t a big drinker in those days but did have a night or two on the stuff with Glenn. I found it hard to get through Losar without–regardless of one’s degree of willingness–imbibing much chang… I did get my one and only case of hepatitus from drinking chang in one of the local chang shops. I wanted to spend some time everyday speaking Tibetan to guys who knew no English and were willing to sit and talk “naturally.” Most of my Tibetan friends knew English so well that such conversations were forced. So down at one of the (illegal) chang shops I would meet different, garrulous types and talk for an hour or so. But come spring, a young bacterium’s mind turns to thoughts of… infecting someone. Bingo. Thankfully, Yeshe Dhonden was around. I avoided alcohol for a year afterwards, with the exception of a small bit of Cointreau I tried at Gene Smith’s home in New Delhi some months later, just to see if I would react badly. I was fine. I mention Gene because his generosity to to students and scholars of things Tibetan was legendary and because that generosity, as well as his own monumental scholarship, was on brilliant and touching display yesterday at a memorial service (Gene passed away in December) at the cathedral of St. John the Divine in New York. It was a very touching gathering, bringing together scholars from at least three continents who shared memories and appreciation of Gene, all interspersed with some wonderful musical interludes and taped remembrances. Yeah, sad I never met Gene. But he had read my work! And liked it!! When I was told that, I was so stoked! Now where were we, about food? Berzin had worked out the chinese name connection, though we spelt it differently. But here in Sydney we tend to order in the local hostelries in Cantonese, e.g. har gao for prawn dumplings. I tend to know little about Chinese though we do have Chinese relatives (as well as Tibetans). End of ramblings. Back to work.